The flat 64-lamp monochromatic rotating LED uses a wireless power supply to power the rotating part. 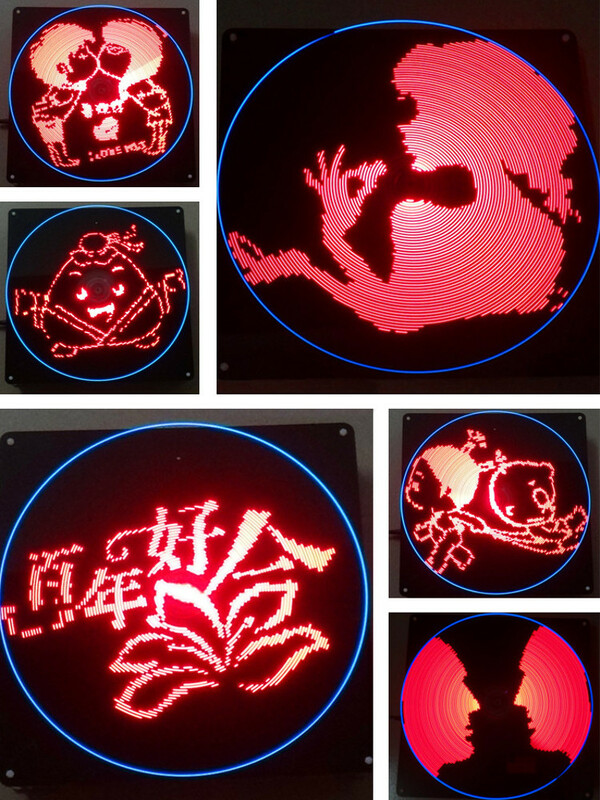 The rotating part is controlled by a STM8S105K6T6 LQFP32 SMD MCU, with a 4M capacity flash. The display part is a 0805 monochrome LED. PC software to update the picture, text, animation, calibration time. Monochrome text display, black text on white background. With the high-performance motor FR370, the speed is high enough to make the display stable. Use wireless power supply to power supply to the rotating part, and the rotation is quiet and the service life is long. 1. Flat text scrolling cycle display: The scrolling can be controlled by the remote controller, and the displayed text content is updated by the host computer software. Up to 1800 Chinese and English characters can be displayed, and the font and character size can be modified! Can’t exceed 24X24 pixel size. 2. Flat digital scroll clock display: The clock is provided with a backup battery, which remains working after power off. Only this mode can set the time through the remote control and can also adjust the time by changing characters software. The setting time is very convenient. 3. Flat display dial pointer clock: This mode and digital clock fully synchronized, can be used as a clock. Adaptive rotation speed display is stable. 4. Flat clock display: This mode is fully synchronized with the digital clock and can be used as a clock! Adaptive rotation speed display is stable. 5. Flat display picture: The default automatic switching pictures, can be converted to manual switching picture by remote control. Up to 136 pictures can be stored. 6. Flat display animation: Support for import gif animation pixel recommendation is 128*128. We soldered the MCU and downloaded related programs and subtitles, other components needs soldering by the buyer. LED lamps and resistors are 0805 package. There is a certain degree of difficulty in the production of spare parts. Please evaluate the soldering and debugging ability to purchase it.